Satellite imagery has become a part of our daily digital lives; we use stills of our planet to navigate to the mall, for goodness sake. But when those images are moving, the result is so stunning that it’s almost magical. 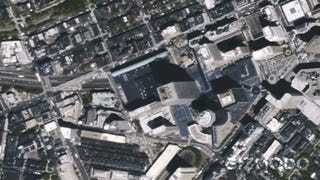 UrtheCast has released the first full-color HD video of Earth shot from the International Space Station. And it’s just freaking gorgeous. UrtheCast published three videos captured by its ISS-mounted ultra HD camera, which Gizmodo compiled into a short montage. The camera (named Iris) can zoom into an area of about 1.19 x 0.67 miles. Here you can see footage of London, Boston and Barcelona, almost as animated maps: freeways buzzing with cars, colorful container yards in motion, boats drifting down the Thames. I was surprised how emotional I got watching these. Although the images aren’t live, there is a difference between zooming in on a frozen moment on a grainy Google Earth image and watching humanity in crisp, precise motion from above. To me, seeing ourselves in this way feels almost like another Pale Blue Dot moment—a new portrait of our planet from space. Check out more of Gizmodo’s original videos.